A pleasant warm color temperature of the video. 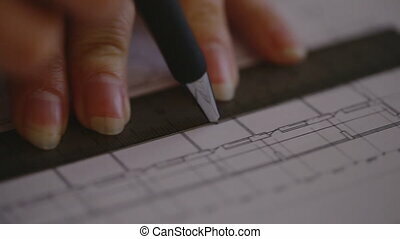 woman checks the size of the compass on blueprint and makes corrections in the electronic tablet. She is dressed in a modern office business clothes yellow tones. in the background is the phone, keyboard, mouse, tablet, professsionalny tool for sketching pencil and markers, all of this is on the table from an array of light wood. Live camera - camera movement on the slider to the right. A pleasant warm color temperature of the video. 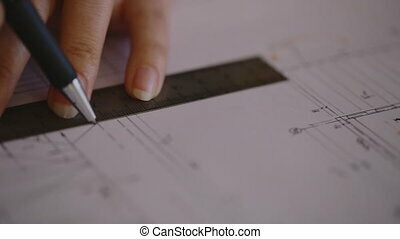 woman checks the size of the compass on blueprint and makes corrections in the electronic tablet. 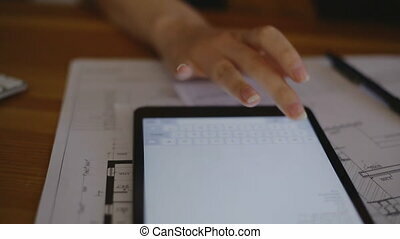 She is dressed in a modern office business clothes yellow tones. in the background is the phone, keyboard, mouse, tablet, professsionalny tool for sketching pencil and markers, all of this is on the table from an array of light wood. Live camera - camera movement on the slider to the left. A pleasant warm color temperature of the video. 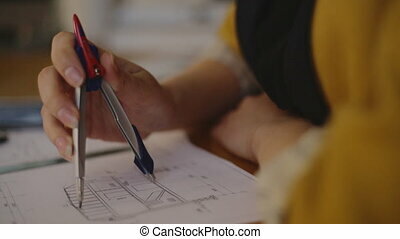 woman checks the size of the compass on blueprint and makes corrections in the electronic tablet. 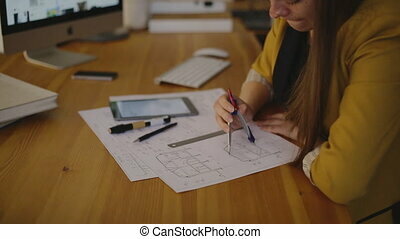 She is dressed in a modern office business clothes yellow tones. 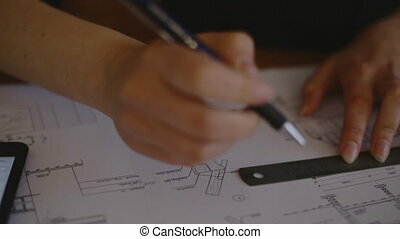 in the background is the computer monitor, is two books on architecture, is a telephone, keyboard, mouse, tablet, professsionalny tool for sketching pencil and markers, all of this is on the table from an array of light wood. Live camera - camera movement on the slider to the left. Close-up dvieenie camera on the slider along the video, we see the blueprint, making notes in tablet range with the help of which made line drawings and a huge A3 drawing volumes and cuts, cross-sections and thicknesses of bearing and retaining walls, with project designs a house or a large mall or parking lot - who knows. in the video we see a really expert in their field, who really enjoys his seasoned professional education and job responsibilities. camera movement to the right. Close-up dvieenie camera on the slider along the video, we see the blueprint, making notes in tablet range with the help of which made line drawings and a huge A3 drawing volumes and cuts, cross-sections and thicknesses of bearing and retaining walls, with project designs a house or a large mall or parking lot - who knows. in the video we see a really expert in their field, who really enjoys his seasoned professional education and job responsibilities. camera movement to the left. Macro super Close-up dvieenie camera on the slider along the video, we see the blueprint, making notes in tablet range with the help of which made line drawings and a huge A3 drawing volumes and cuts, cross-sections and thicknesses of bearing and bearing walls, ready construction projects at home or a big mall or parking lot - who knows. in the video we see a really expert in their field, who really enjoys his seasoned professional education and job responsibilities. camera movement to the left. A pleasant warm color temperature of the video. 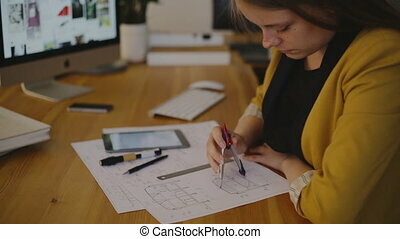 woman checks the size of the compass on blueprint and makes corrections in the electronic tablet. She is dressed in a modern office business clothes in bright colors. 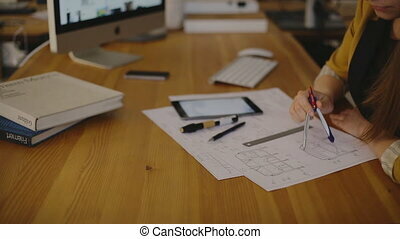 in the background is the computer monitor, is two books on architecture, is a telephone, keyboard, mouse, tablet, professsionalny tool for sketching pencil and markers, all of this is on the table from an array of light wood. Live camera - camera movement on the slider to the right.